Please send me more information on Caborey Cruiser! It's difficult to express just how delightful it is to motor along the fabulous Baja coastline, cool cocktail in hand, upon the decks of an elegant vessel. But don't take our word for it—take the Caborey cruiser and enjoy an elegant dinner and a cruise around Cabo San Lucas Bay aboard the largest catamaran in the Los Cabos area. Glide along the Pacific coast, taking in fabled sights like the Arch and Lover's Beach. Sight whales and dolphins in season during your explorations, while enjoying a nice meal on board. You'll be served the finest gourmet meals and enjoy international entertainment. Or head on on an unforgettable snorkel tour! 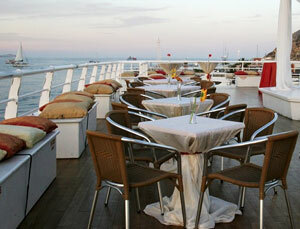 The Caborey has a wealth of luxurious amenities (such as fabulous sun decks) and the best facilities on board. Join us for an unforgettable vacation on the sparkling blue waters at Baja's tip. Premium Dinner & Show: Experience the natural wonders of Cabo San Lucas from aboard our luxurious 144' triple deck catamaran. From the moment you board the Caborey prepare yourself for an exhilarating experience. The majesty of the Land's End rock formations including Cabo's iconic "Arch" will spread out before you as the Caborey slips away from the marina and into Medano Bay. Live Music and limitless cocktails accompany the breathtaking view from the upper deck of the Caborey as it follows its route along the tip of the Baja. Sit back and enjoy an exciting Mexican & Argentinean show, performing the most representative traditions from countries, mariachi singer and the most spectacular Las Vegas-style Tango. This breathtaking show is bigger and more spectacular than any other stage show in the area! Meals for children (age 0-4) are available for $20, paid directly to Caborey. Sunset Mexican Dinner: Get your camera ready! Caborey’s Sunset Dinner provides an excellent view of Cabo's most breathtaking sites including the famed "El Arco", Land's End, the Sea Lion Colony, Lover's Beach, the pirate's cave and more from the upper deck of our luxurious catamaran, the largest and best-equipped in Los Cabos. An open bar and delicious Fajitas Dinner is served with exquisite service as you tap your feet to the rhythms of our live international band. We'll cruise along the coast on the Sea of Cortez, and around Land's End, the southernmost tip of the peninsula, and slip into the Pacific Ocean where a glorious Baja sunset awaits. An unforgettable experience that will be the highlight of your Los Cabos vacation! Enjoy a close up view of one of the most beautiful mammals to inhabit the seas. Don´t miss the opportunity to be part of this millenary tradition in our 3 level vessel, where your Whale searching experience will be the best opportunity for a great picture! Catch a glimpse of a majestic tail or with luck, watch with amazement as these 30 to 40 ton animals lift themselves out of the water, spin in the air and come crashing back down into the water. Breakfast buffet: Chilaquiles, hot cakes, scrambled eggs, beans, fruit, bread, coffee and open bar (national drinks only). Snorkeling Cruise: Cruise from the marina along the coast to Chileno Bay, an exquisite underwater paradise located 30 minutes from Cabo San Lucas. Let yourself go in the amazing submarine life of this live natural reef, let the relaxing breeze and sweeping underwater wonders of the Sea of Cortez carry you away. Walk along the bay, visit to the Arch, 1 hour on beach, snorkel equipment, games, dance and surprise! Open bar (national drinks only), continental breakfast and Mexican buffet lunch.